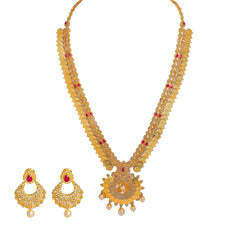 22K Yellow Gold Necklace & Earrings Set W/ Ruby, Pearl & CZ on Detailed Collar & Cutout Pear Pendant for women. 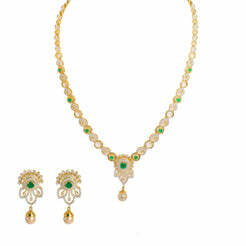 This absolutely stunning set is embellished with rubies, hanging pearls and precious CZ gems. It has an elaborately textured crossover chain with smooth crawling vine detiais and a two stranded bead chain. The necklace is 14" long with width range of 2-12 mm. The pendant is 62 mm long and 33 mm wide. Each earring is 50 mm long and 18 mm wide. The set weighs a total of 63 grams. Wear this set to truly make a statement at your next formal affair.